With more and more consumers in the U.S. migrating from brick-and-mortar stores to online stores for shopping, they are likely to come across an abundance of Chinese goods, which have flooded online retail platforms like Amazon and eBay. A closer overview of consumer product reports in three Chinese provinces in November reveals that consumers are at high risk of using unsafe goods—some of which may be on sale on American retail sites. In Zhejiang Province in eastern China, the provincial bureau of quality and technical supervision announced a quality report on tissue products, reported by the Chinese regime mouthpiece CCTV on Nov. 26. 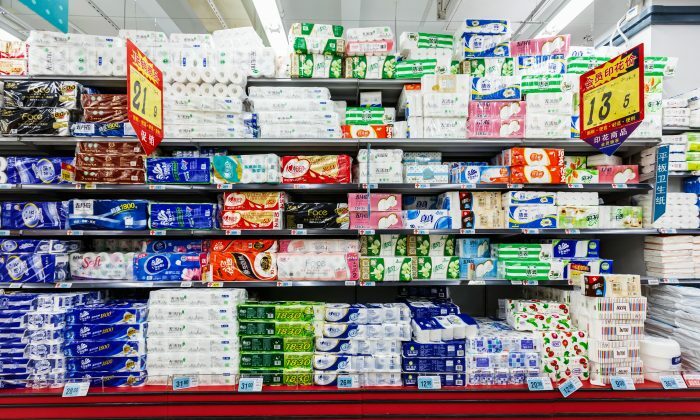 Of 88 samples of tissues and 74 samples of toilet paper from different domestic brands, 35 failed to meet quality standards. Three tissue samples were found to have illegally used unprocessed waste paper pulp to make the tissues, evident by the multi-colored residual dots that appeared on the surface of the tissues. Additionally, these samples were all found to contain excessive amounts of fluorescent brighteners—which could be harmful to the human body. Five toilet paper samples were also found with high amounts of bacteria, far higher than the levels allowed by regulations. Another five samples contained more dirt particles than the allowed national standard. One common problem among the failed tissue samples was false advertising: 13 samples fell short of the number written on the packaging. In one example, one tissue pack labeled as containing 500 tissues only contained 132 tissues. Six tissue samples had poor wet tensile strength—meaning the tissues easily tore apart after coming in contact with water or sweat. On China’s popular microblogging site, Weibo, some netizens were angry. “What is wrong with our country…why is there no sense of safety in life,” wrote a netizen from Fujian Province. “I use Nepia, a Japanese-brand tissue. I am afraid to use domestic-made tissues since I might come down with gynecological diseases…it is so not hygienic,” wrote a netizen from Guangdong Province. Others offered suggestions for better safety checks. “I suggest more tests be done on tissues sold by major e-retailers [in China]. Some tissues sold on Tmall do not look to be of good quality,” wrote a netizen from Anhui Province. The Zhejiang bureau also announced on Nov. 10 that of 33 wallpaper companies, six produced wallpapers with water absorption problems. Elsewhere in China, according to a consumer product report by the Yunnan Provincial Administration for Industry and Commerce released on Nov. 6, a list of 145 products failed to meet national quality standards, ranging from clothing, liquid and powder laundry detergents, to water pipes. Among them, 50 children’s clothing items failed to meet the quality standards, with inadequate fiber content, inappropriate pH levels, and inaccurate labeling on tags. In Beijing, the local administration for industry and commerce announced a report on Nov. 8, stating that 13 facemask items were found with safety issues, most of them failing to meet the required filtering standard. Then, on Nov. 22, the administration announced that seven kinds of firefighting equipment used by the local fire department—three types of emergency lights, two types of fire hoses, one powder fire extinguisher, and one fire hydrant—failed to meet safety standards.